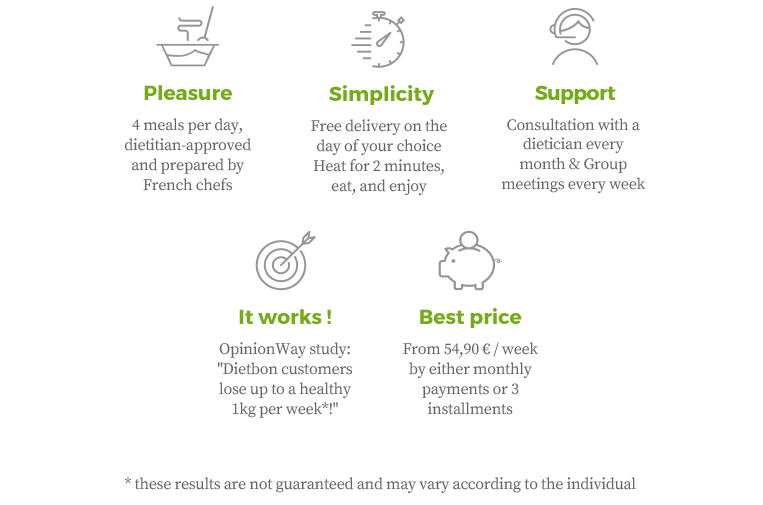 DietBon Review : Hélène lost 25 kilos in 8 months with Dietbon ! "I was able to lose weight without being tired, without feeling deprived and without feeling hungry!" My weight has fluctuated all my life. Each time when events in my life became complicated or stressful, I gained weight and then lost it by following very strict diets. For 10-15 years, after my first two pregnancies I managed to maintain a healthy weight, then after my third pregnancy, I was no longer able to lose weight despite following a strict diet based on boiled vegetables with no carbohydrates. I thought it's over, I'd never lose weight again. And then, by chance I came across Dietbon. So I too tried the adventure, telling myself that I had nothing more to lose but everything to gain if it worked. The first month I lost 6 kilos. I couldn't believe it! Especially since I was eating satisfying and delicious meals! We were a long way from the boiled, tasteless vegetables of my old diets. I also began to understand that starchy foods were not necessarily my enemy and that as part of a balanced diet, could help me to lose weight! So, I was able to lose weight without being tired, without feeling frustrated, without feeling hungry. My whole journey has been unbelievably easy. The free day allowed me to have some fun so that I could stay on track and not be frustrated. It really reassured me. The follow-up with my dietician was a great support. She gave me good advice and it was a pleasure to share my weight loss with her every month. Today I have lost nearly 25 kilos, I still have about 10 kilos to lose until I reach my goal. The pace has slowed down, I lose about 1 kilo per month and it suits me very well. It's not a contest and I'm glad it's coming down gradually. Slowly but surely, as they say. Healthwise, my diabetes has greatly improved, I feel like walking again, I have more energy. I am much more active, and it is great!